WARNING: The following post is long and very, VERY dry. Trust me on this… DO NOT read this for entertainment value! 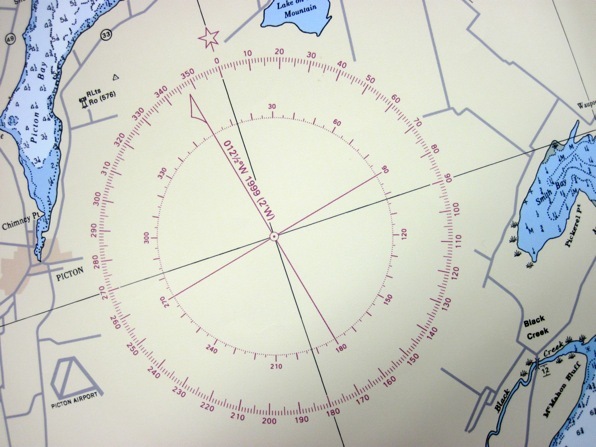 On every nautical chart you will find a compass rose similar to the one illustrated below. 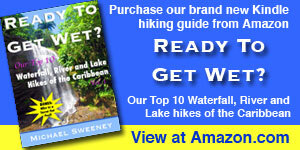 This one just happens to be on the chart for our local waters. You will see that in the image there are actually two compass circles, an inner and an outer one. The outer circle’s star at the top, labeled 0˚, refers to True North. If you look on the inner circle you will note that 0˚on it, which refers to Magnetic North, does not match up with the outer one. This angular difference between True North and Magnetic North is referred to as Variation. This difference varies not only on where you are in the world but it also changes each year! Why is this important? The compass on our boat shows magnetic bearings, but often courses are plotted using true bearings. Because of this difference we need to be able to go between the two figures taking this difference into account. How do we do this? Using the above image as an example, we first need to figure out what the variation would be today. Inside the two circles it says 12 1/2˚ W 1999 (2’W). What this means is that in the year 1999 Magnetic North would have been 12.5 degrees to the West of True North. But it also indicates that there is an ANNUAL INCREASE in this variation of 2′ (the ‘ symbol indicates minutes. There are 60 minutes in 1 degree). I say INCREASE because it is also to the West. If it had been East it would have been a DECREASE. So, with today being 2010, 11 years later, we need to multiply 11 x 2 to calculate the number of minutes difference. Because it says that this change is to the W, which is the same direction as the initially-listed variation, we will need to add this amount. This will be easier to do if the figures are both in minutes. So, 12.5˚= 750′ (12.5 x 60). Now let’s get this back to degrees. Rounded off we end up with a variation today of approximately 13˚ West. OK, so now we know that today, on whatever chart the above compass rose is marked on, Magnetic North will be 13˚ to the West of True North, and so will every other point on that compass. I’m sure you can imagine that 13˚ is a fairly significant amount that definitely needs to be taken into consideration when plotting a course! 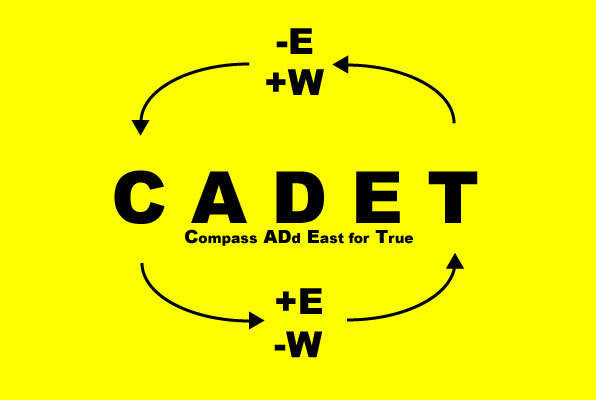 This acronym is a reminder for the process of going back and forth between Compass (Magnetic) bearings and True bearings. As an example, let’s say that you were steering a compass course of 090 (zero nine zero, not ninety) and we have the variation of 13˚W (from our calculations above), how would we determine the True bearing? Because we are going from Compass to True we will use the bottom of the graphic (note the direction of the arrows). If the variation was East we would be adding it from our course. Because it is west we will do the opposite and subtract it. 13˚ deducted from 90˚ gives us a True bearing of 077. What if we had a True bearing and wanted to know what course to steer? We would then use the top of the graphic (arrows are pointing from True to Compass). Using an example of a 050 True course and the same 13˚W variation we would add 13 to 50, coming up with a magnetic, or Compass bearing of 063. That’s pretty much it. There are a couple of other ways to remember this, but the above seems straight forward enough, once you get your head around it. We have one more variable in this process yet to be discussed and that is Deviation. Deviation is defined by wikipedia as “the error induced in a compass by local magnetic fields.” This varies from boat to boat. If we know the Deviation of our boat’s compass we can calculate how it affects our bearings using the same basic formula. See. I told you not to read all that! I can’t believe that I even took the time to write all that!!! We’re tired of being slow! To be honest, if you are navigating by chartplotter (most common) you use the “course made good” from the GPS, which is based upon true north. The difficulty with a compass course is currents, which you can never be quite sure of. Leeway is also a guess. That said, learn the chart stuff and coastal piloting because electronics can lie. The last time I ran the C&D canal my chartplotter showed me on the service road the first half of the passage. At night there is no substitute for being completely comfortable with your geometry. The last time I was in Cape May, though I had been there ~ 50 times in daylight, was my first time at night. How different. The chartplotter was off, 2 ATNs were off station (hurricane Bill was a few days before), and I was glad to have a daylight memory and good night vision. Additionally, I had a GPS die once, well into a passage. Dead reckoning is fun, at least in daylight. As a rule, I suggest using the chartplotter on open water and the charts + ATNs + your eyes when in close. The Coast Guard moves ATNs as needed, and the chartplotter may not know that. The eyes and the depth sounder are the main things. I’ve got the same binoculars – good choice, or at least mine have lasted a year! Rebecca and I were just talking about GPS on the drive home from tonight’s class. We have a Garmin chartplotter and will be upgrading to a newer colour one. We also have a handheld Garmin for backup. Knowing how to do all this plotting is important I though I think, even if we do default to using electronics as the primary method once out there. By the way, we received your Guidebook in the mail today! Thank you. I have yet to really look at it but I’m sure it will be very helpful once in your area, Drew. Great post, good idea for a series. Good for your learning, a nice intro for newbies out there to follow along. Top job. Thank you Marc. After spending all that time writing that post I definitely have that section down pat now, that’s for sure. Sorry Sandra. You should have heeded my warning. Get the basics right and know how to use them even in a storm. Electronics are great but they do fail. Having sailed for more than 45 years in the southern hemisphere. Last year when the lightening took the GPS out I had to remember CADET and I was in the northern hemisphere where the latitude numbers get smaller as you go down the chart. Love your blog. Do keep it up. Thank you for the kind words, Harry. I definitely agree that the fundamentals are important. We’re willing to invest the time to get started on them now, and keep them up when on the water. It’s good to know how to do TSD (time,speed,distance,oh wait,that may be the next chapter…)but really,nav work is pretty easy. Anything less than a 20 mile trip,I run the mainsheet across the chart,take a reading,drag it to the compass rose and voila-that’s where were goin!